Call Trucks Only Internet Department 602-354-7623 for all the specs and to schedule your test drive! 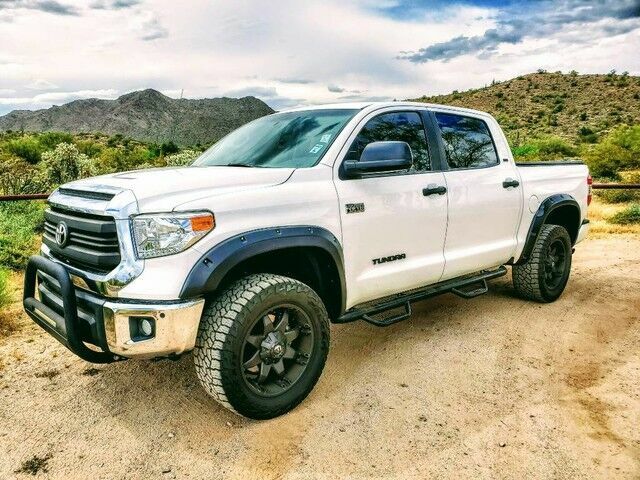 Locally owned lifted 2016 Toyota Tundra SR5 2WD with custom front bumper, Fuel custom wheels, and Falken Wildpeak tires. Also includes power windows and locks, AM/FM/CD audio options, cruise control, running boards, and fender flares. Together with our State-of-the-Art Service and Accessories Center, we are very proud to offer an EXCLUSIVE Lifetime Lift Warranty on most of our lifted inventory! Is this vehicle not EVERYTHING you want? Ask your representative what accessories and upgrades might be available! First Oil Change on us, with every vehicle purchase. Ask if this vehicle qualifies for our Lifetime Engine Warranty! *Diesel and high performance engines are not applicable. Trucks Only has been in business for over 40 years. Our customers have helped us to earn and maintain the A+ rating with the Better Business Bureau and we have been honored to achieve the Customer Satisfaction Award with DealerRater 3 years in a row! Call Trucks Only Internet Department 602-354-7623 for all the specs and to schedule your test drive! Shipping is available across the United States! Please let us know how we can help you find the right solution for your needs!